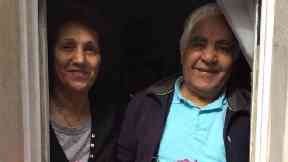 Mozaffar Saberi and his wife, Rezvan Habibimarand have lived in Scotland since the 1970s. Relief: Mrs Habibimarand and Mr Saberi. The Iranian grandparents of Scottish rugby star Damien Hoyland have been granted leave to remain in the UK after the Home Office reversed a decision to deport them. Mozaffar Saberi, 83, and his wife, Rezvan Habibimarand, 73, had been told they must return to Iran despite their children, grandchildren and great-grandchild all residing in the UK. The couple have lived in Edinburgh since the 1970s, originally coming over when Mr Saberi was a student in Edinburgh. An online petition calling for the deportation decision to be reversed garnered more than 125,000 signatures and on Monday it emerged that the couple have been given leave to remain in the UK. In a statement, Mr Saberi and Mrs Habibimarand's son Navid Saberi said: "You did it folks, you did it, thank you does not sound/feel enough but thank you. My parents will not be deported, just received the confirmation. Thank you for all your efforts, likes, shares and signatures. "I should thank John Vassiliou, our solicitor, and his team who stuck with us in the last six years and never gave up hope and kept us motivated. "Many thanks also go to the Scottish Minister for Europe, Migration and International Development Ben Macpherson MSP and regional MSPs Alison Johnstone and Andy Wightman who all wrote letters on our behalf, and also to David Lammy MP and Diane Abbott MP for helping to raise the case's profile on social media. "Lastly, I would like to thank Amelia Hill, Kaye Nicolson, James Matthews, Mary McCool, Elizabeth Burden, Zamira Rahim, Rima Amin, and Amanda Coakley just to name a few (sorry if I've missed names). "You gave us joy and proved that hope still lives in this country. We are forever grateful and wish we could thank you individually." Mr Saberi and Mrs Habibimarand's leave will be valid for a period of 30 months and will be renewable every 30 months until completion of a total of 120 months in the UK. This means that in around ten years' time they will be eligible to apply for indefinite leave to remain and one year after that, if they wish to do so, they may apply for British citizenship. John Vassiliou, the solicitor dealing with the case said the total cost to the couple throughout this process will come to almost £20,000. He stated: " This is the price of a human rights visa... and this is the price that all those granted leave to remain in the UK on human rights grounds must face.
" Over the last few years, costs have risen to a level tantamount to binding 'successful' applicants to ten years of indentured servitude to the Home Office; all in the name of continuing to remain in the UK after it has already been accepted that their removal would breach the UK's human rights obligations."